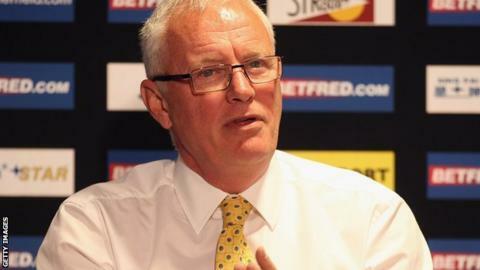 World Snooker chairman Barry Hearn does not believe in false modesty. The snooker supremo, Matchroom Sport mogul and boxing promoter-turned-Leyton Orient chairman, claims to be the "best in the world" at what he does. Since his return to his first sporting love nearly four years ago, even his harshest critic would struggle to argue that Hearn has not made a significant impact. At the time, Hearn said snooker was in desperate need of salvation. "It was much too cosy," he told BBC Sport. "It was dying, it was dormant, it was moribund. "It was a part-time sport and in today's world you can't be a part-time sport. "When I took it over I said I would blow it up and start again and that is effectively what we have done - and it's working. "To me, the opportunities were so obvious and crystal clear that the job was easy. This is what I do for living. I have done it for 40 years and I think I am the best in the world at what I do. "It has been fantastic. When I looked at it four years ago I saw a sport where the management was non-existent, and everyone was going through the motions built around a BBC contract. They had settled for a slow decline." Slow decline was never going to lie comfortably with Hearn and the progress has been clear. Snooker is once again enjoying something of a boom period. Much of that is down to the the sport's new-found worldwide appeal - which has tapped into the explosion of interest in China, India, parts of Europe and other destinations around the world. "The globalisation is the biggest success without a doubt," Hearn added. "We all knew China was going to be big and we have made it bigger. We thought we should have an event in Australasia and we did. We thought we should try South America and we did - and we may return there. "We think the biggest breakthrough is potentially the Indian Open. The Indian sub-continent is a massive potential market for us. "The overseas audience is bringing new players to the table. "We haven't got a major event in the Middle East at the moment, so is that the next one? "India has gone really well. Do they just want one a year? China is a massive market but we can't be complacent. We will be more a global sport." Television and online "exploitation" has meant the prize money has more than doubled from £3m to more than £7m. "In a recession market. It is difficult to criticise," Hearn said. The snooker calendar is also stacked to such an extent that players now pick and choose events. Current world number nine Mark Allen warned that travel expenses could decimate player numbers, while there has even been talk of snooker burnout, with world number two Mark Selby blaming his early exit from this year's World Championship on fatigue. Former world champion Peter Ebdon was against Hearn's takeover of the sport from the start. And snooker's biggest draw and current world champion, Ronnie O'Sullivan, pulled out of the 2012-13 season because of "personal issues" after previously refusing to sign World Snooker's official players' contract earlier in 2012 because he felt it was "too onerous". Hearn gives the dissenting voices short shrift. The UK Championship's new format is the perfect example of what he believes is the right way forward. The tournament at York's Barbican Theatre features 128 players in the first round, with the top seed playing the number 128 and so on. No longer are the world's top 16 guaranteed places in the latter stages of most ranking events. "It's one of those opportunities in the 'Brave New Aldous Huxley World of Snooker' where ability is the only criteria and you find out how good you are," Hearn said. "Players will only ever look at a system and ask the question 'How does this affect me?' That is a natural reaction from human beings - selfish, but natural. "My responsibility is to ask how will it affect the game. This is competition in its purest sense. It is absolutely on merit, on the day. "The fascinating thing will be round one. Of the top 64 seeds in the world, playing the next 64 in the world, how many upsets will we get and how many people will grasp the opportunity? "Then you really see who you are dealing with and who is the best." Hearn expects 10-16 shocks in the first round at "top whack". But says surprises and a shake-up are exactly what was needed. "The old system was so protective of the top players," the 65-year-old said. "They were guaranteed a certain amount of money and ranking points. To my mind life is not about guarantees, and sport is not about guarantees. It is about the unexpected. "This system is so brutally fair that it will cause some ripples - and that's what I want to do." The ripples have been felt. But most appear to have slowly warmed to the new regime. The financial rewards have clearly helped appease some of those who doubted. Hearn knows he cannot please everyone but, unsurprisingly, he does not care anyway. "Sport is about giving players opportunities, it's not about giving them money," he explained. "Sport is about money. All the glories are down the road. Initially it is all about cash. How do you get the top players? Easy. Push the money up. If you want the top players in golf, snooker and tennis you have to come up with the top prize money and if you don't you get what is left." "Life's tough but the rewards are great. In any industry where the rewards are good it comes at a price. The players have to trust me and I think I have won over the trust of most of them." "There is always a danger of overkill and I think I did it myself in the late 1980s and 90s. We learnt from it. It wasn't a colossal mistake, but I am aware of it much more now. You have to make sure the product is at a premium. If you supply more than the demand you will devalue the product." "Our global audience is at a level we have never seen before but people get parochial and say 'When are you going to get 18m again on the BBC?' (viewing figures for Steve Davis v Dennis Taylor). Answer? Never. The world has changed and we have to change with it." "If they are good enough to take their opportunity they deserve the money they win. First-round losers get nothing, no matter who you are. "They either improve or they get another job. I have no sympathy with them. Once I give them the opportunity, my job is over. "There will always be a few because their life has changed. It's not peaceful and getting yourself ready for a tournament every two or three months. If they are not prepared to join me, get off at the next stop." Hearn has no intention of slowing down just yet. A "bloody nuisance" of an Achilles injury sustained in the gym may have hindered his movement and temporarily scuppered his own golfing exploits, but nothing seems to have affected his passion for what he does in the 31 years since Matchroom was a tiny operation run out of a small office in Romford and he had his hands on everything. He has learned to let go a little bit. Son Eddie is now the main man for Matchroom's boxing arm, and Hearn says it is an interesting adjustment. "It's tough to let go," he admitted. "But when you appoint someone to manage, you have to let them manage. "My son is a better promoter than me, though I would never tell him, but it does not stop me having my opinions. "I have opinions about football, but if [Orient manager] Russell Slade started being influenced by my opinions, I would sack him. And the same with Eddie." Hearn is still involved in the boxing as well as darts, and with his boyhood football team. Even ping pong got the Hearn treatment in January. He has not finished with snooker yet either. "We are a class sport and I think we provide entertainment, but we have not exploited ourselves properly," he said. "That has changed massively but there is still more change to come. "The world has changed and we have to change with it. The answer is to push on and be as big as you can be. We are on that way." Hearn believes he will know when he is no longer the man to lead from the front and it is time to completely relinquish control. "In my dotage, they still give me a free ticket," he added. "One day my son will probably charge me. Then I will know the end of the empire is nigh." Who will struggle with new UK format?